The Wildcats will be vying for their 12th SIAC championship and second in a row. Those were Head Coach Kevin Porter’s thoughts on the Fort Valley State University Wildcats SIAC 2016 Championship win, its first conference title since 1999, and they are just as relevant today as the team is on the verge of another. The players worked hard all season in hopes of a repeat and now destiny may be at their doorstep. The team will try to take their place in FVSU’s storied championship history this Saturday, November 11th, at the SIAC Championship football game. Wildcat Stadium will host the FVSU versus Tuskegee University game, with a kickoff time of 2:00 p.m. The game will be broadcast on ESPN3 as part of their ESPN.com/watch platform. Tickets for the game are $20.00 for general admission and $25.00 for reserved seats. They can be purchased at www.wildcatticketoffice.com. In honor of Veterans Day, veterans and current members of the military can purchase tickets for $10.00, half off the general admission price, upon showing their ID’s. Current FVSU students and high school students with ID’s can purchase discounted tickets for $15.00. Discounted tickets must be purchased at the stadium on game day. This is the first time the SIAC championship game will be held on the campus of a team participating in the contest. The Wildcats clinched their second straight SIAC Eastern Division Title with a 52-7 victory over the Morehouse College Maroon Tigers in the October 28th Homecoming game. The Wildcats will enter this Saturday’s championship game with a 5-4 overall record and 5-1 SIAC record. 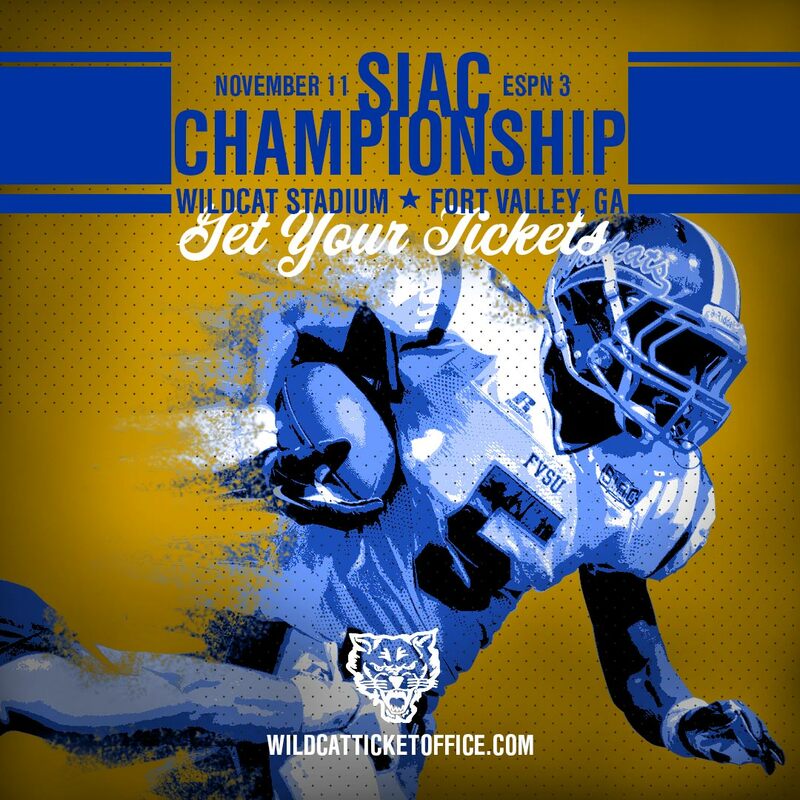 Saturday, the Wildcats will be vying for their 12th SIAC championship. The Golden Tigers of Tuskegee are on a quest of their own, however, looking to win their 31st SIAC championship. This season, their record is 8-2 overall, and 6-0 in the division. Gates open at 12:00 p.m. Attendees are encouraged to get there early to catch the pregame ceremony.